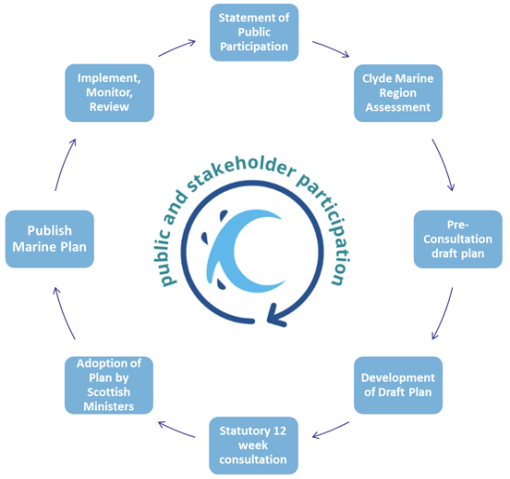 The Clyde Marine Planning Partnership (CMPP) was formally established in February 2016 by a number of the members of the Core Group of the Firth of Clyde Forum including some of those who served as members of the Steering Group of the Clyde Scottish Sustainable Marine Environment Initiative. Marine Scotland nominated the CMPP as the delegate for taking forward regional marine planning in the Clyde and published a public notice to this effect and consulted on a draft Direction in February and March 2016. In March 2017 Roseanna Cunningham MSP, Cabinet Secretary for Environment, Climate Change and Land Reform, signed the Ministerial Direction which delegates authority for marine planning in the Clyde Marine Region to the CMPP. Once adopted by Scottish Ministers the Plan will be statutory in nature. The CMPP is a statutory consultee in all marine pre-application and licence applications. As part of the planning process CMPP staff have completed the ‘Assessment of the Condition of the Clyde Marine Region’ identifying significant pressures and main issues to be dealt with in the marine plan. This can be found on the Clyde Regional Marine Plan page, along with Topic Sheets of key information from selected chapters of the Assessment. Core to the CMPP’s approach is public and stakeholder input. The Statement of Public Participation outlines key periods of time in the plan development process and ways that people can get involved. Read the SPP here. To work towards integrated, sustainable and co-ordinated planning and management of the Clyde Marine Region’s environmental, economic and community resource. To develop a regional marine plan which meets the legal requirements of the Marine (Scotland) Act 2010. To undertake projects, activities and further research in order to implement the statutory regional marine plan. To use the ecosystem approach to develop and implement marine planning and Integrated Coastal Management (ICM) initiatives. All Firth of Clyde Forum Core Group members at December 2015. Any organisation with coastal and marine duties in the Firth of Clyde or an organisation with relevant statutory duties. Any corporate body or person who, in the view of members, can provide significant additional relevant skills or expertise in delivering the objectives of the association at a Clyde-wide level and which cannot be secured by the association by other means. The CMPP Membership is currently made up of 22 stakeholders from a wide range of sectors with interests in the Clyde Marine Region. Before applying for Membership, the CMPP encourages applicants to review the list of Members and consider how their application will bring significant or unique expertise to the CMPP, in addition to existing Members. Any corporate body or person wishing to become a member should apply in writing and a decision on their membership will be taken at the next members meeting. There is no membership fee. Further details and how to apply can be found in the CMPP Constitution and operational guidance document. The Operational Guidance document also provides information on the requirements of Membership. Members meet once a quarter to discuss the development of the Regional Marine Plan and a quorum of 8 members is required at every meeting. Throughout the development of the regional marine plan, there will be opportunity for anyone to take part in policy development of specific issues via working groups, workshops and subgroups. Please sign up to the newsletter and keep an eye on our website for updates on the consultation and events pages to see what is planned in your area and how you can input into plan development through consultations, events, surveys and workshops. The CMPP has also published a Statement of Public Participation which gives more detail about key periods for involvement. Members of the partnership at this time are listed below. The role of the CMPP Board is to act as a decision-making mechanism when three or more Partnership members object to a proposal, recommendation or decision at a partnership meeting. Board members are required to make decisions based on the objectives of the Partnership. They are appointed as individuals and do not represent any particular business, industry body, interest group or authority. The Partnership board will be a combination of six individuals nominated by organisations with a permanent board position and up to six individuals elected by the other partnership members. This shall take place at each annual members meeting. The list of members with a permanent board position will be reviewed at each annual members meeting to ensure that they remain appropriate. Any changes will be made following a majority vote by members. A quorum of six members is required at each Board meeting. Brian brings experience of the shipping, marine insurance, ports and transport industries. His existing role at Clydeport and understanding of the interrelationships between the many Stakeholders in the Clyde area will be applied to support the aims and objectives of the Partnership. Currently Councillor for Girvan and South Carrick ward of South Ayrshire Council, Peter has an intimate knowledge of the Clyde area having lived in Campbeltown, Girvan and Maidens. Originally from Fair Isle in Shetland, he has been involved in the maritime environment all his life. Professionally, this included working for the Northern Lighthouse Board (with service at Ailsa Craig and Sanda in the Clyde) and over 20 years’ service on Her Majesty’s Customs and Excise (HMC&E) vessels and operations. Peter is also a member of the Royal Yachting Association Scotland. Arthur oversees SNH’s marine planning work. He also manages projects and partnership teams that operate across the central belt, with an emphasis on green infrastructure and place-making. He has a degree in zoology from the University of Bristol, and a postgraduate diploma in recreation & leisure management. He is married with three children and enjoys hill-walking in his spare time. David was first elected as a Councillor to Argyll and Bute Council in May 2007, representing the Helensburgh & Lomond South Ward. In November 2013 he took on the role of policy lead for Planning and Regulatory Services, a position he has continued after being re-elected in May 2017. David also Chairs the planning committee since taking up the position of policy lead. Stuart is a graduate of the Glasgow School of Art/University of Glasgow and a chartered town planner with extensive experience spanning 30 years in development planning both at the local and strategic levels. Stuart sits on a number of Boards in the Glasgow and Clyde Valley region and brings a wealth of knowledge and experience from these to the CMPP. Karen Yeomans was appointed as Executive Director, Economy & Communities in August 2014 having held posts of Head of Service and Economic Development Project Director since she joined the Council in June 2012. Prior to arriving in Scotland she held several Corporate Director roles at Advantage West Midlands. Karen started her career as a chartered surveyor working in both London and Paris before undertaking an MBA at London Business School. Since then her career has focused on delivering major initiatives via effective public/private sector partnerships. Alastair qualified as a biochemist/microbiologist and worked for many years as a manager involved in environmental protection, regulation and management of surface waters, waste and air across Scotland. Alastair has experience of inshore fisheries management and regulation and of developing, implementing and advising on environment management plans and fisheries management plans. He is a Fellow of the Chartered Institution of Water and Environmental Management Chartered Environmental Manager and a Member of the Chartered Institute of Management. Alastair is currently Chair of the West Coast Regional Inshore Fisheries Group, Argyll & Ayr FLAG, Dumfries and Galloway FLAG, Solway Firth Partnership and a Director of Solway Heritage. Alex graduated from Heriot Watt University with a BSc. in Applied Marine Biology and is currently studying for a Master’s degree in Environmental Decision Making. Alex is an individual Scottish Sea Angling Conservation Network (SSACN) member and she also acts as an Advisor to SSACN on the Firth of Clyde. Alex has over sixteen years of fisheries management experience with a particular emphasis on the Firth of Clyde and the Solway Firth. Alex now works for Sustainable Inshore Fisheries Trust (SIFT) as Projects Coordinator, where she has been in place for five years. Elaine holds an MPhil in Policy and Governance and has over a decade’s worth of senior management experience, working nationally and internationally in fields including: European Policy, financial management, on partnership projects and in the arts. Elaine has family roots on the Argyll coast and islands which has instilled in her the cultural importance of fishing communities to Scotland’s coast. Elaine is also the Chief Executive Officer of the Clyde Fishermen’s Trust and Chair of the Inshore Committee on the Scottish Fishermen’s Federation. Howard is a long term resident of Arran and advocate for the marine environment. Qualified as a Master diver and instructor, Howard has utilised this skill as a Seasearch surveyor and by coordinating and taking part in joint marine research work around the island. Howard sits on the board of two environmental charities and is the recipient of several awards including: Scotsman newspaper Green award (2009), Goldman Environment Prize Europe (2015) and OBE awarded for services to the marine environment (2015). The public authorities and the Clyde Marine Planning Partnership (CMPP) have been delegated the responsibility to develop a Regional Marine Plan (RMP) for the Clyde. It is the intention of Scottish Ministers that the public authorities will undertake this duty through their Membership of the CMPP, which ensures their involvement with the Statement of Public Participation (SPP), plan development and the consultation process. The CMPP will be the primary contact for regional marine planning in the Clyde Marine Region. In so far as consultation with third parties is concerned, the public authorities will undertake their duties through their membership of the CMPP and through the activities agreed by the CMPP and undertaken by the CMPP staff. A SPP will be prepared by the CMPP to demonstrate the inclusion of communities, local stakeholders and the general public during development of the RMP. The CMPP website (and social media) will provide all public-facing information on the plan development process, including the SPP and any workshops, events and consultation to be undertaken throughout the process. The public authorities will provide links on their websites to the CMPP website. In this way, the consultation duties of the public authorities under paragraph 6 of the Direction will be carried out. The CMPP will have regard to responses made during consultation when finalising the RMP. In this way the public authorities will deliver their duties under paragraph 7 of the Direction. This does not preclude the public authorities from responding to the consultation. This agreement will remain in force for as long as the Direction from Scottish Ministers remains in force, unless an amendment is agreed by all parties. Regular updates on the progress of the development of the Regional Marine Plan are written, these are available to read on the Clyde Marine Plan page. Marine Licences are required for certain activities in Scottish waters such as marine construction works, dredging of seabed sediment for navigation or other purposes, and installation of marine farm equipment, to list a few examples. The Marine Scotland Licensing Operations Team (MS-LOT) are the responsible authority for issuing Marine Licences for licensable activities in Scottish inshore and offshore waters on behalf of Scottish Ministers. Before issuing a licence, MS-LOT will carry out a consultation with statutory and relevant non-statutory consultees. These can include the Northern Lighthouse Board, Scottish Natural Heritage, the Scottish Fishermen’s Federation, Royal Yachting Association Scotland and the Maritime and Coastguard Agency. The Clyde Marine Planning Partnership is a statutory consultee for Marine Licence applications and pre-application consultations sought within the Clyde Marine Region; this duty came into force when the Ministerial Direction for the CMPP was issued in March 2017. Currently, the CMPP is developing the first statutory Regional Marine Plan for the Clyde, and therefore CMPP Members have agreed that the CMPP will not respond to any consultations until the Regional Marine Plan has been agreed by Scottish Ministers, except in exceptional cases (e.g. where an application does not consider the National Marine Plan). Prior to the adoption of a Clyde Regional Marine Plan by Ministers, where it is deemed necessary to respond to a consultation, responses will be based on the policies and advice within the UK Marine Policy Statement, the Scottish National Marine Plan and the Clyde SSMEI Marine Spatial Plan. For more information on Marine Licensing, for example which activities require a licence, guidance for applicants and information on the pre-application process, please visit the MS-LOT website.